Though oil markets started the week off strong (more on that below), a late-week bout of risk-off sentiment triggered by unexpectedly hawkish comments from US Federal Reserve Chairman Jerome Powell and surprisingly strong US data over the course of the week, caused risk assets to sell off, taking crude down with them. The hawkish tone, coupled with the stronger data, led to a surge in the dollar and rates, causing a surge in treasury yields which has brought the bond bears out of hibernation. The fear of course is that much higher rates would pressure equity markets while a more hawkish Fed could begin to unravel risk markets. It is still too soon to say if there is a broader risk-off event in the making, but clearly speeches by Fed officials will be parsed for shifts in tone going forward. 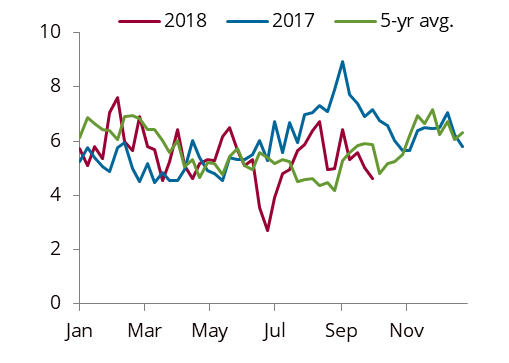 Ultimately, we do view recent moves as a bit of an overreaction, as the Fed is reflecting the strength of the US economy, and we see no change in the policy path of gradual rate hikes. Wednesday’s US economic data releases, which surprised very much to the upside, were the spark for the rallies in the dollar and rates. Two weeks ago, we noted that wages were ticking higher across a broad spectrum, which risked stoking inflation fears (see Macro digest: Florence and the machine, 21 September 2018). This week, the ADP employment report showed a m/m increase of 230,000 private sector payroll jobs in August, well above consensus expectations. Virtually every single employment indicator is pointing towards acceleration since the summer. It really is time for the rubber to meet the road as the rising chorus of complaints about the insufficiency of labor supply looks to be running into a wall of rising demand. Higher wages are the key to balance this disequilibrium. Meanwhile, the service sector PMIs globally are really starting to make the case that the dollar strength is due to economic growth as opposed to risk aversion (or the right side of Stephen Jen’s dollar smile), as most of the rest of the world’s PMIs look to be expanding at a steady pace even as US PMIs hit even higher. 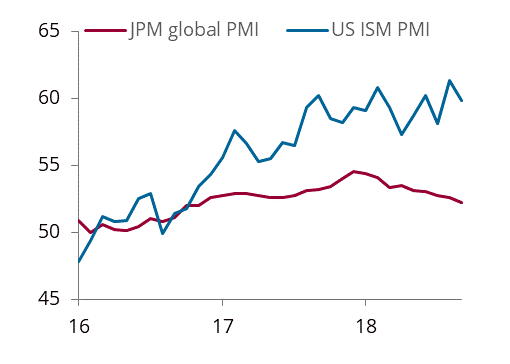 Outside of the US, there is not a lot to remark on, but the JP Morgan Global PMI aggregates (see figure 1) suggest that on a GDP-weighted basis global growth is holding up a lot better than perhaps is popularly thought, although admittedly indicating growth is at a slower pace than a year ago. Finally, US auto sales came out of nowhere to post an outsized increase from 16.6 million annualised in August to 17.4 million in September, a big surprise given that all the major auto suppliers (domestic and foreign) missed their numbers quite handily in September. Regardless, this should be good for both September retail sales and bodes well for broader Q4 18 economic data. These inflationary data trends became more significant following Powell’s ’long way from neutral’ comments after the trading day close on Wednesday. The Fed chairman was basically saying the Fed is nowhere near done. Coming on the heels of strong data, this—more than anything—got bonds and the dollar moving. Anyone who had previously doubted Powell’s hawkish credentials could no longer do so. Markets are still only pricing in a terminal rate of just under 3%, which is probably where the Fed thinks neutral is, though there remains a robust debate as to what is the ‘neutral’ level. But the bottom line is that the notion that the Fed will need to go to restrictive appears to be gaining acceptance in the FOMC. With risk assets falling on Thursday, everyone is now asking how much further does the move in rates have to go? It is hard to know as these trends can happen slowly and over long periods of time. Many in the market already believe that the Fed has been too slow to start hiking rates and is now behind the curve, and Powell’s comments this week only reinforce that view. The structural factors that have kept US long-term interest rates low are now fading and yields are set to move significantly higher, or back to ‘normal’, but at what pace is unclear. For the Fed, this is what they meant by ‘normalising’ rates. The markets which look the most vulnerable in the near-term are those that have seen a significant increase in supply of treasuries since the financial crisis—emerging market (EM) debt and US corporate bonds have been among the biggest beneficiaries. This is a big risk for down the road and that is why bond markets have reacted to the Powell comments. 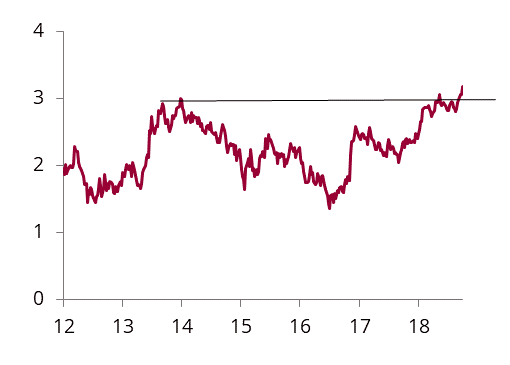 The upward pressure on the US dollar from higher rates is going to continue to pressure EM and corporates going forward. Meanwhile, the US economy continues to surpass expectations and the growth divergence between the US and the rest of the world keeps widening. Generally speaking, a bull market becomes most evident when bearish data gets bought. This week, a bearish set of EIA weekly data led to a sell-off in crude which was cut short and bought back aggressively for no apparent reason. Traders were buying the dip. We had already started off the week on a relatively bullish tone as the market had finally begun to accept that Iranian volumes are going to fall further than consensus had assumed and, more importantly, that Saudi Arabia and others will struggle to fill the supply shortfall in Q4 18 despite increasing production and destocking. President Putin also hammered home the point to President Donald Trump when he said the US sanctions policy on Iran was to blame for higher prices. Speaking in reference to Donald Trump, Putin said ‘if you want to find the culprit of who's guilty that prices are growing then you should just have a look in the mirror’. Russian Energy minister Novak told Russian radio that ‘there is a risk that oil prices may hit $100 per barrel as soon as this fall given all the uncertainties around Iran’s supplies’. We still maintain that price will need to ‘do the work’ and will need to ration demand in the short-term. Putin’s public rebuke of Donald Trump has fuelled all sorts of speculation that the Trump administration will either start greenlighting Iran sanctions waivers or that the Trump administration will seek a path to the negotiating table. Both are wishful thinking. The Trump administration has continued to tell buyers of Iranian crude that the goal remains to reduce Iranian exports to zero. Full stop. Meanwhile, the White House has set the bar so high in terms of what it would take for relations with Iran to be normalised, it is effectively a non-starter. There is no table for the Iranians to come to. And those who believe that waivers will be forthcoming should not hold their breath. While we do expect to see some waivers at the last minute, sources tell us that they are likely to limited in scope and duration and would be specifically to help those who have been working hard to reduce their volumes and aid them in their drive to zero imports. In other words, countries that may need a little extra time to get to zero might get some special consideration. But this means there are not going to be blanket waivers, which are what buyers would need in order to reverse their decisions to stop buying Iranian crude. The goal remains to get Iranian exports to zero. The SPR also continues to come up as a possible solution to higher prices, but that option seems increasingly inadequate and is running out of time. Our soundings indicate that the current infrastructure is a constraint. The SPR system was designed to substitute for lost imports from somewhere else. The system was not designed to supply incrementally more barrels on top of imports. The DoE itself noted in a recent study that although the SPR maintains connectivity to major pipelines and terminals, in certain cases, the SPR can no longer bring oil to market without disturbing commercial oil flows. 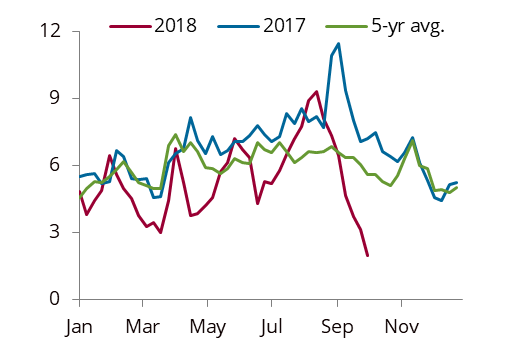 With exports and domestic production rising, and imports still at a relatively high level, our soundings suggest that there is perhaps scope to release 10-15 mb per month. Note that this is a net number, meaning that any releases already scheduled in a month, as is the case for November, would reduce the incremental amount that can be made available. Moreover, all the talk about an SPR release because of surging crude prices is a bit misplaced. The only thing the Trump administration really cares about is retail gasoline prices ahead of the midterm elections. And right now, retail gasoline prices should come under pressure seasonally. In many ways, the peak of the concern about the potential for $3.50 per gallon gasoline is well past. With a month left before the midterms, we think the window has likely closed on an SPR release, unless the administration needs a distraction. Brent: Crude prices continue to surge higher as the sour market tightens, and new buyers keep emerging. The loss of Iranian barrels is now being fully felt across the supply chain. Asian crude diffs are rising, and the Saudi OSPs for November have done nothing to dent that perception. Freight rates are rallying as the loss of the Iranian tanker fleet has meant that replacement vessels are needed. With tankers getting arbed east, there is less freight available to capture North Sea barrels. This has kept Brent spreads somewhat subdued. However, attention is now also shifting to prompt margins, which are getting hammered. But we would note a few things. First, the margin weakness is only at the front, but run cut decisions are driven more by forward margins, which remain healthy. Second, margins in Asia, where crude prices are currently the most expensive globally, have held up pretty well, which means that product demand in Asia remains robust. It is perhaps too soon to talk about margin-induced run cuts, beyond some trimming in utilisation at the margins. But clearly since the spike in oil is driven by lower crude availability, margins need some time to play catchup. Margins in Europe are struggling. And, to be sure, if there are no sour barrels to be had in Q4 18, then margins must compress to keep runs low, but that will ultimately lead to product stock draws, which will then lead to a margin rebound, which can then support higher spreads and flat price. This is now a sequencing game. Ultimately, as long as the east needs barrels, this will benefit Brent until Asian margins also get squeezed. 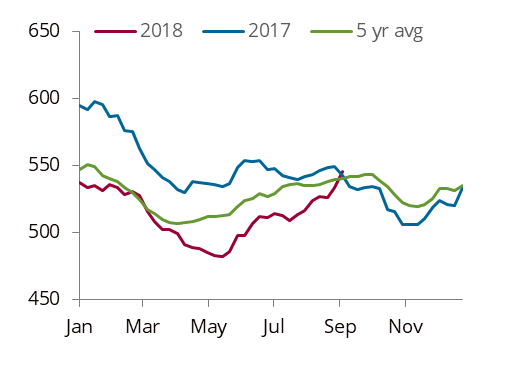 WTI: US petroleum stocks have dramatically reversed their trend from earlier in the year, as total US petroleum inventories have gone from some 24 mb below the five-year average to nearly 25 mb above it in a span of five weeks. To be fair, almost all of that surplus to the five-year average has been in products, while crude remains right at the five-year average. And, almost all of the surplus in products to the five-year average is in other oils. Products ex-other oils remain right at the five-year average. Cushing stocks meanwhile built by 1.7 mb over the week. Weeklies are trending to flat stocks in September and we forecast October builds to total 2.4 mb. With Sunrise set to ramp up from November, much will depend on the rates pipes out of Cushing flow and, given the tremendous pull on US crudes from the rest of the world, we expect outbound flows from Cushing to be maxed out for November and December. All of which means that while Cushing may build, the competition for US grades is going to intensify. We expect US crude exports in Q4 18 to average 2.42 mb/d versus our previous expectations of 2.1 mb/d, as global balances continue to tighten. 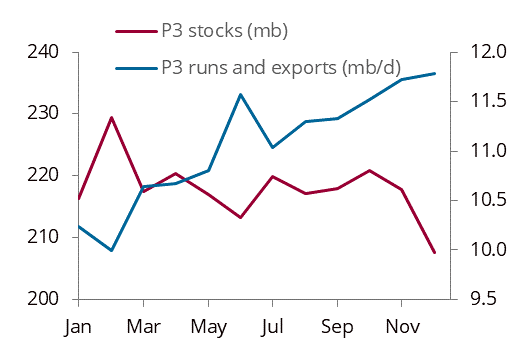 If runs remain high, PADD 3 stocks will draw by at least 10 mb over Q4 18 (December draws at 10 mb), ending the year at a staggeringly low 44% utilisation rate, a level not seen since January 2014. With USGC grades surging vs Brent as domestic refiners bid up local crudes, WTI will need to be weak and do the work to keep the export arb open if the rest of world wants to win in this battle. Due to the Easter holiday the next Digest will be published on 26 AprilThe sequel to the cult cla.. While a lot of the press focus and commentary this week will be on Brent hitting $70 per barrel—a.. 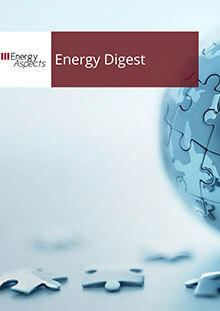 The collective gasp that you probably heard early in the week was triggered by the inversion of t..
Back in January, in the first Macro Energy Digest of the year, we argued that the market in Decem.. It has been a tough slog for crude traders over the past few months, especially as much of the sp..